Wild Quinine (Parthenium integrifolium) and Glade Wild Quinine (Parthenium auriculatum) are frequent and sometimes common members of North Carolina Piedmont diabase woodlands. For unknown reasons, they may co-occur (as in the image to the left) or be found singly at a given site. Both flower profusely in open, prairie-like sites, especially after burning although individuals may persist vegetatively for long periods under somewhat shaded conditions. Wild Quinine is the wider ranging of the two, being found nearly throughout the eastern US (where often associated with high quality, prairie or savanna-like habitats). 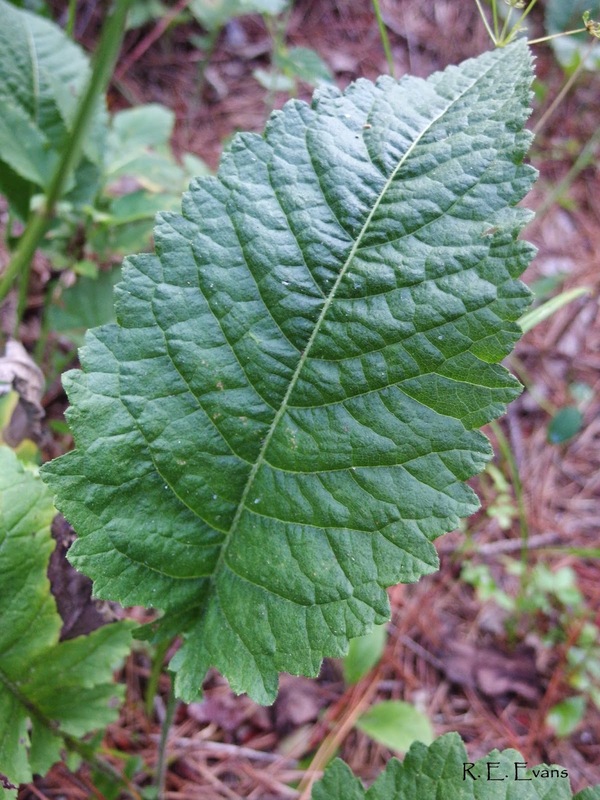 Glade Wild Quinine is the southern cousin ranging roughly from West Virginia to Alabama. The former may be found nearly across NC, while the latter is restricted to a handful of Piedmont counties. Both species have similar appearance with large, coarse, basal leaves. P. integrifolium is much less hairy, often has a dark reddish mid-vein apparent on the larger, mostly basal leaves. It also tends to be a taller and larger plant when flowering (up to 3' or so). P. auriculatum has a more petite, compact form, and longer blooming period. The toothier leaf margins help distinguish Glade Wild Quinine, and many plants show a sheen of white pubescence even from a distance while the hairs on Wild Quinine are much less developed and obvious. The upper image (right) is Parthenum auriculatum, the lower is P. integrifolium; both in full flower (an insect has chewed into one on the lower plant. Large expanse of Parthenium integrifolium on a clayey, upland flat with deeper soils derived from diabase.